In honour of Mother's Day and my mom's birthday this weekend (yes, it is as financially stressful as you think it is...just like my brother's birthday being 3 days after Christmas...and my dad's birthday three days before Father's Day....what is up with my family???? ), I've decided to talk about something other than blushes, and to put the spotlight on my mom's skincare since she basically doesn't even age (she's 50-something) and SHE DOESN'T EVEN WEAR MAKEUP, GUYS. Asian genetics, better than serums. 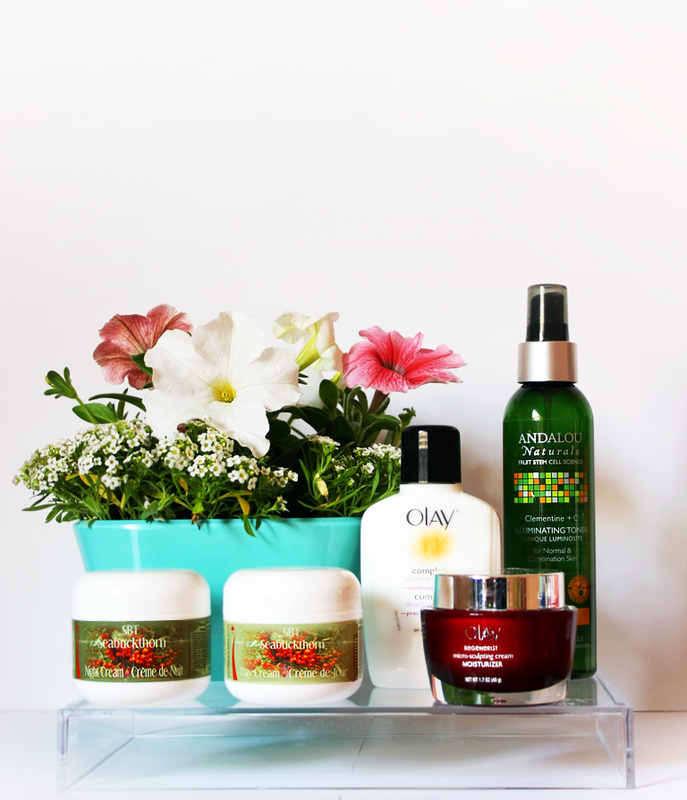 For the day, moisturizer of choice is SBT's Sea Buckthorn Day Cream or Olay's Complete All Day moisturizer (SPF 15). Since the Olay moisturizer contains SPF, it's her go-to when it's sunny out, and since she hasn't complained about it despite her sensitive skin, it's probably doing a decent job, considering plenty of products break her out (-coughcough Clinique-). At night, it will either be SBT's Sea Buckthorn Night Cream or Olay's Regenerist Micro-Sculpting cream. My mom has repurchased both sea buckthorn creams too many times to count, and when I asked why, she said in her sassiest tone, "It's good! ", so I'm assuming she swears by this stuff. The Olay cream was actually a recommendation by Shayne/Queen of All You See (her review here), and my mom has already picked up two jars of this stuff to treat her wrinkles, so it's probably a noteworthy moisturizer. Anyways, shoutout to my mom for being an inspiration to me and putting up with my general life antics (i.e. answering my numerous skincare questions for this post). I have to admit though, every time I see how much grayer her hair gets everyday, I get a little misty eyed, but that's another issue to be dealt later. Anyways, what are your Mother's Day plans?